Having toured the US and Europe with a rotating line-up on the back of first album 2013’s Together at Last (recorded in Brooklyn’s Marlborough Farms studio and featured performances by members of The Ladybug Transistor, The Clean, The Aislers Set, Crystal Stilts and Love is All), Mark Monnone eventually got to work back home solidifying the group’s line-up with some of his favourite local players: Joe Foley on bass, Louis Richter on guitar and Gus Franklin returning to the throne having played drums on (and co-produced) the first album. This was to be a more sonically-driven line-up with Richter’s 12- string riding high in the mix and Monnone’s growing collection of fuzz pedals finding their place among the glorious racket. All the while, as ever, the pop song wins out and Monnone’s proclivity for a winsome turn-of-phrase and bruised-but-beautiful melody shines on through. 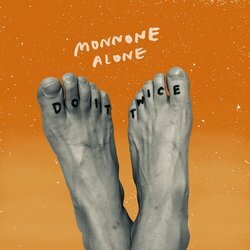 Having spent the last few years caressing their new vibe, Monnone Alone have sought out the bright lights of the studio, along with the expertise of producer Gareth Parton (The Go! Team, Foals), and Summer of the Mosquito is now ready to set your ear a-buzz all night! 'Do It Twice’ is a vibrant slice of the outfit’s storied history and yet another exciting glimpse of their sophomore LP. Repurposed pop tropes and nuanced moments of surf-soaked doo-wop weave in and out of the track’s layered guitars and hearty percussion, driving home a fully realised indie-rock warble that has come to define the band’s sound.